I cannot tell a lie — this project was kind of a nightmare. The beading itself went fine, but the shopping and the long and tedious (and painful) finishing work were kind of horrible. This is the second project that has drawn my blood. But look! A finished bracelet. It has a nice weight to it and it fits perfectly around my wrist with a nice clasp. So what if it required Elmer’s glue to hold the knots in place, right? And no, I won’t show you the back. It’s an ugly mess of threads. – Start with the right tools and you’ll save yourself a world of hurt later. In this case the fact that my original thread wouldn’t fit through my needles came back to bite me during finishing. I should have rethreaded the loom in the smaller thread. – Know how you’re going to finish a project before you start it (a corollary to the previous lesson). I could add any number of cynical lessons here about avoiding projects that don’t feel right, but I don’t want to belittle my experience. It was tough. I’m glad I did it. This project, like the sweater pillows, brought back a lot of memories for me. I can’t believe I’d forgotten about my beading days back in college. Next week I’m teaming up with a friend to do a project for her garden. Have a great weekend! I started my bracelet last night and, as I expected, it is coming together quickly. There have been some setbacks already, though. The thread I bought in the beading aisle is too thick for the needles I bought in the beading aisle (you can see the two threads in the photo above). 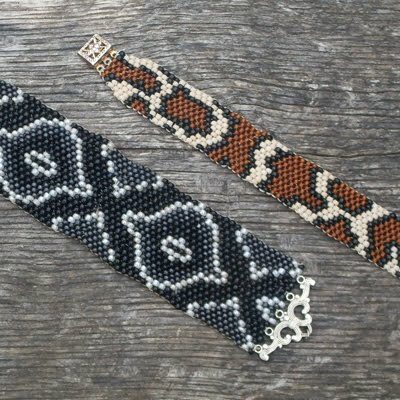 The bracelet pattern I chose – Redman by Ayla – is way more than 1″ wide. This is going to be more like a cuff than a bracelet. I also need to figure out how I’m going to connect the ends of the thread to the clasp I selected. My original theory didn’t work out. All that aside, I plan to finish the bracelet today and show you a finished product tomorrow. See you then! I don’t remember where I got my first bead loom. I have no memory of making one, but I remember that I used a board with small nails in it all through my beading phase in college. I thought maybe I still had it somewhere, but a quick look through an old trunk yielded close to nothing (more on that later). So last night I persuaded my husband to help me make another one. We rummaged around in our utility room to find an appropriately sized board and nails. I measured around my wrist and added an extra two inches, then marked the board for the nails. I figured 10 nails on each end would work. My husband took over when it became apparent that I was not going to manage getting all 10 nails in without bending them in every direction. Also, because it was late and I was tired and frustrated. Thanks husband! As I was digging around in my trunk of old college things I discovered a box with beading supplies in it. In that box was an actual bead loom! I have a vague memory of someone gifting me with their old beading supplies, but I have no recollection of who that was. If you’re reading this thank you! I may use that loom for a later project. Now I’m ready to start my project. Check back tomorrow to see how it’s going. My trip to the bead aisle of my local craft store was probably the most intimidating of my craft blog career so far. I had to fight the urge to run away in fear. Why? There were way too many options and too many people browsing the same aisles as me. I was out of my depth. I wasn’t sure exactly what I was looking for, and I was plagued by doubt that the seed bead project was really the right one to be doing anyway. I mean, there are loads of different beautiful beads out there just waiting to be strung together into lovely jewelry. Will my seed bead bracelet be awesome at all? In the end I bought three colors of seed beads, thread, and a couple of beading needles. I briefly considered buying a prepackaged bead loom kit that included beads, needles, and instructions, but in the end I decided against it. I want to show you all how to make a homemade bead loom, and I was pretty sure that the materials included in the kit wouldn’t really be what I was looking for. I escaped from the store unscathed and ready to get started. Come back tomorrow when I show you how to make a simple bead loom. I spent some of college making bracelets for my friends with tiny seed beads on a homemade bead loom. When I first thought about including a seed bead project on this blog I Googled for some ideas, but the results page showed that the craft of jewelry-making has made a giant leap forward since then. I’m going to stick with a simple seed bead project this week and hopefully take a class on more advanced techniques later in the year. Join me as I shop for beads, make a homemade loom, and ultimately make a fun bracelet.